The Interference Archive in Brooklyn, New York, contains over 10,000 items that are accessible to the public. The Archive explores the relationship between cultural production and social movements through exhibitions, a study and social center, talks, screenings, publications, workshops and an extensive website. It features numerous objects that are created as part of social movements by the participants themselves: posters, flyers, publications, photographs, books, T-shirts and buttons, moving images and audio. On June 1 the new exhibition “Take Back the Fight: Resisting Sexual Violence From the Ground Up” will open. In this current political climate, design has a major role to play in maintaining a loyal opposition and a heartfelt resistance to injustice. This Archive is one of the methods. I asked a few of its major contributors—Bonnie Gordon, Jen Hoyer, Louise Barry and Kevin Caplicki—to discuss its role and goals. I’m amazed that the Archive is new to me, since much of what you collect derives from my own early years in the late ’60s. Tell me how and why you started this important collection? Interference Archive originally formed to address the need for activists to document and tell their own histories. The perspective of those working to affect social change has often been marginalized in the mainstream telling of history and by institutions vested with the responsibility of preserving these histories. Traditional institutions—including libraries, universities and museums—sometimes enact restrictions around access to historical materials which should be made accessible to all. Interference Archive sought to combat this problem by creating a public archive and social center where activists, students, educators and those who played a role in producing cultural materials used in movement work would be able to access and share this information freely. Initially, the archive grew out of the personal collections of its four founders. While conducting research for the Signs of Change exhibition that they collaborated on, Josh MacPhee and Dara Greenwald increasingly understood the importance of making their own collections of social movement culture more accessible to the public, and yet they weren’t comfortable giving these to any of the institutions they were visiting. They hadn’t found an institutional archive that made everyone—especially the people this activist material is about—feel welcome. They collaborated with their friends Molly Fair and Kevin Caplicki in 2011 to open up Interference Archive as an all-volunteer, collectively run activist archive that continues to grow through continued growth of its volunteer community, as well as continued donations of material which expand the collection. Interference Archive focuses on collecting the social movement cultural ephemera, and much of this comes from the radical left and grassroots organizing. Our collection contains a significant amount of materials from the 1960s and ’70s due to the explosion of the counterculture of that time. 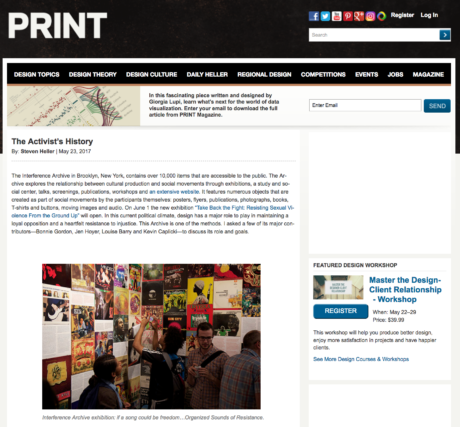 The founders of the archive are also members of the Justseeds Artist Cooperative and draw inspiration from the graphic output of OSPAAAL of Cuba, Emory Douglas from the Black Panther Party, Liberation Support Movement pamphlets, Rufus Seger’s cover designs of Anarchy magazine, anarchist artist Clifford Harper, and countless others. Justseeds members and Interference Archive are not only collecting but continuing these legacies. What are your parameters? Is it entirely protest from New York City? The materials we collect and preserve represent the history and the cultural production of social movements around the world and across time. We focus on collecting material that was produced in multiples for widespread distribution, including everything from posters and prints, buttons, T-shirts, periodicals, pamphlets, zines, books, moving images, audio recordings and other ephemera. How do you acquire and store your materials? Our entire collection is acquired by donation. Many activists have held on to remnants of their organizing activities because they want it to be preserved somewhere, but they aren’t comfortable with the option of giving it to a big institution that might require credentials or would make other activists (or even just non-academics) uncomfortable. They are very excited to bring it to Interference Archive, to sit down and talk with us about it, and to see that it’s in a place where others can readily access it. Our collection is stored in our open stacks archive in Brooklyn. “Open stacks” means that any visitor can walk in the door during our open hours, without appointment, and take boxes off the shelves to look through the material themselves. We prioritize access, because we believe that this material is best preserved through use—we aim to preserve the original intent of widespread distribution and continual circulation of these items. In light of this focus on access, we organize everything in our archive by format—posters with posters, books with books—and not grouped by donation, and then within each format we organize material either by subject or alphabetically by title. Given your location on street level, I presume you are community accessible. What do you foresee as your audience and how do you see the materials being used? The main audience of Interference Archive is a diverse group of artists, educators, students, activists and community organizers who come from across NYC and around the world. We aim to build community among artists and organizers across political movements, foster a better understanding of historical and contemporary struggles, and inspire a new generation of creative political agents. Rather than viewing our archive as a static collection of material, we see it as a resource that can influence the way people understand themselves and the world they live in, and that can inspire people and communities who are acting for change in the world today. This means that we organize a lot of events, to help people feel really comfortable interacting with our collection: workshops, talks, reading groups, accessioning and cataloging parties, and more. We also put on regular exhibitions, which get this archival material up on the walls for people to talk about, and with each exhibition we try to publish some kind of printed document that, more than a catalog, will act as a resource for anyone who is interested in the movements or issues depicted in the exhibition. As an archive we have to think long term, and imagine a future audience as well as a contemporary audience. So as well as trying to disseminate information widely right now, we think about our internal structure and sustainability to ensure we are here as a support system and resource for activists and movements for a long time to come. What also surprises me is that the era of print and street communication during the ’60s (The East Village Other, The Rat, Other Scenes—all pubs I worked for or with) show a continuation in the materials you collect. Internet notwithstanding, how has media changed since then to now? Some of the aesthetics have evolved, but exploring our collection demonstrates that the media has not changed. Organizers still print newspapers, posters, flyers, handbills, stickers, buttons, pamphlets, etc, to disseminate their politics and struggles. There is still the need for physical production of media, possibly now more than ever. What has evolved is the ability to spread graphics digitally. Supporters display their solidarity with contemporary struggles by changing their social media avatars with symbols. They share images, historically printed as posters, on their Twitter, Instagram and Facebook feeds. These graphics are the 21st-century version of the protest button. What are some of the most important documents, in your opinion, in the archive? There is no singular item that stands out as most important; as an archive that attempts to organize itself non-hierarchically, imitating the structure of many of the groups and movements representing in our archive, we also have to transfer this to our collection—we don’t see any item as more valuable than others, but rather we seek to create organizational systems that give equal access and visibility to everything in the archive. At the same time, each object has the opportunity to be “most important,” as each object has the opportunity to be found by visitors and researchers and then help them discover personally resonant connections to the history of struggle for social and eco-justice, which can then inspire them to continue the resistance of oppression. Our whole collection is a reminder of the issues people have battled against, and a reminder that these struggles must continue if we are to improve the lives of everyone. What, most of all, do you want my readers to know about Interference Archive? Jen Hoyer: I think the most important thing for people to understand is that we are an actual archive, and then, following that, we’re so much more than an archive. We live in a world today where the word archive gets spun into a lot of different uses. As the realm of social media reflects more of our public programming work—exhibitions, talks, film screenings, etc—we find that the public often loses sight of the fact that the word archive in our name means that we have a real, growing archive that we spend a lot of time working with and caring for. It’s a resource that we really want people to explore and use. At the same time, we’re also an example of the way an archive can and should function as more than just a room of stuff. As an institution that plays a role in shaping historic narrative just through the fact of what is and is not on our shelves, we’re consciously examining the work we do to build present and future narratives—through intentional decisions about our operational organizing structure, our relationships with each other and the world around us, the work we do to care for and give access to an archival collection, and our work to engage the public with these resources in order to inform current social activism. Louise Barry: I want people to know that our funding structure reflects our values. Most of our money comes from individual donors who give $10–25 per month. We rely on grant funding as little as possible. We don’t have big donors. We are accountable to the community that funds us, and many of these are the same people who donate materials, attend events, volunteer, and participated in the movements that shaped the archive. Kevin Caplicki: I want people to know that we are a political project and counter institution exemplified by our horizontal structure and community support. We are structured similar to the many anti-authoritarian and anarchist movements whose materials we collect. A rotating group of dedicated people perform all the functions of the archive. We are a project produced from, by and for social movements. Organizers with passion and ability get involved to sustain us, and anyone can get involved as a volunteer according to their own capacity.